The Green storm mower is a machine designed for maintaining lawns, golf courses and public gardens. 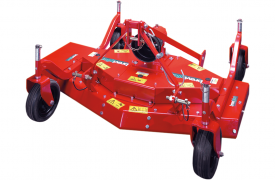 The high rotation speed of the rotors guarantees precise and exact grass cutting. reversible Category 1 three-point hitch, rear or front attachment to tractor, wheels for cutting height adjustment, CE safety guards. cardan shaft, 1000 rpm gearbox, four 270 mm diameter pneumatic wheels, rear power take-off, mulching kit, conversion from side discharge to rear discharge.